A small token of intriguing, even exotic terrains by the enigmatic Loopool is being sent via a nice 3″ CDr by Ad Nauseam records. The background influence for this album, which is the story of DUNE, is evident not only on the cover picture, track title and the quote “The Spice Must Flow”, but also, as I am witnessing right now with my new headphones – in the music. 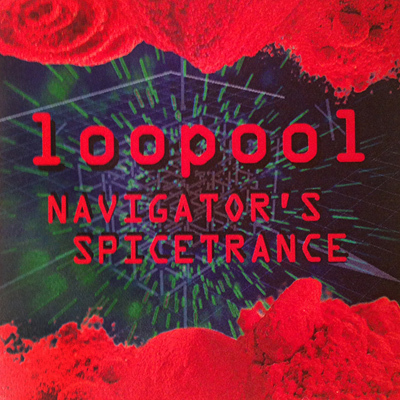 The magic that is woven in this 22:55 long track works, I think, In the small pockets of condensed air, or silence, that emerge like magnificent bubbles between the two main layers of occurrences on “Navigator’s Spicetrance”. We can hear the ongoing desert winds of hot, windy drones flowing endlessly among the second layer of technical, mechanical glitch-psychedelic constructs that Loopool had erected. Immersing yourself in this storm of a conflict between these two beings, the spicetrance really begins when you finally manage to feel the points that stick the two layers together and those pockets where the distance between them is the longest. If you haven’t listened to Loopool yet, this great 3″ is a good release to start with.